The PosiTector CMM IS In Situ Concrete Moisture Meter by DeFelsko is the simple, durable, and accurate way to perform concrete moisture (RH) testing in accordance with ASTM F2170, "Standard Test Method for Determining Relative Humidity in Concrete Floor Slabs Using In Situ Probes". 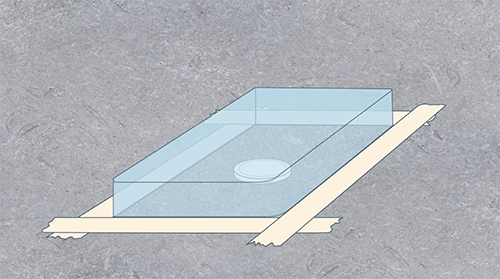 This article compares different methods used for measuring concrete relative humidity in floor slabs, details the innovative concrete moisture measurement system offered by DeFelsko, and explains how the test is performed. 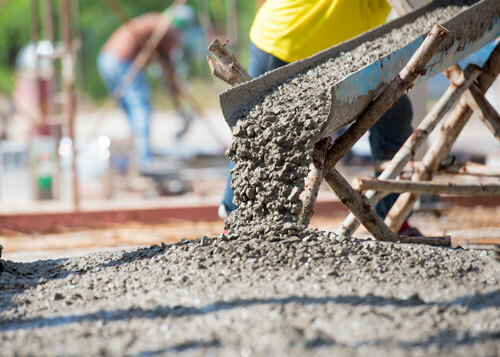 Concrete is a composite material composed of fine and coarse aggregate bonded together with cement (calcium oxide). 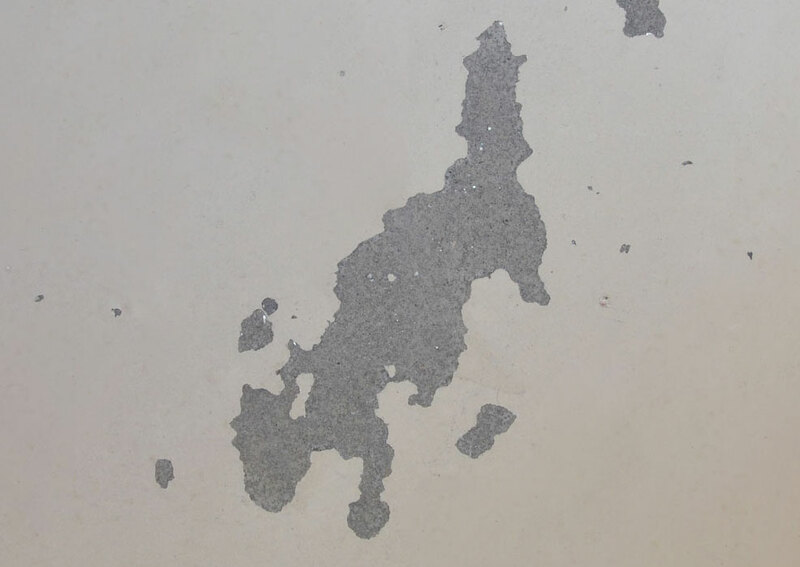 When mixed with water, cement powders undergo a chemical reaction that binds the aggregate materials together into a durable, stone-like building material. However, after hardening (curing), much of this water remains as moisture within the porous concrete structure. Over the following months, this moisture is slowly emitted from the concrete until it eventually equalizes with ambient moisture levels. 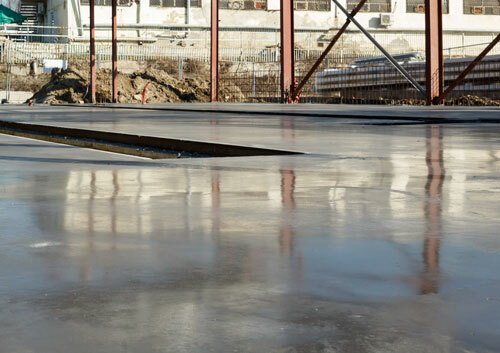 Before applying a protective coating or other flooring materials to a concrete slab, it is critical to ensure that the moisture level inside the concrete has decreased to acceptable levels. If not, moisture can accumulate below the coating or flooring causing discoloration, cupping, buckling, blistering, adhesive failure, and/or mold growth. There are various methods used for concrete moisture measurement. The three most-common methods utilize non-destructive electronic meters, anhydrous calcium chloride, or in situ relative humidity (RH) probes. Non-destructive electronic meters measure the electrical impedance of the concrete, which is related to concrete moisture. Owing to their design, these meters can be affected by other slab conditions such as variations in the concrete composition and the presence of reinforcing materials. ASTM recommends that this type of concrete moisture meter be used as a comparator, and not for determining quantitative moisture content. There is no practical way to calibrate these kits with traceability to national standards. They measure moisture only on the surface of the concrete. They are heavily influenced by ambient conditions. The new industry standard for measuring concrete is the in situ concrete relative humidity test as described in the ASTM F2170 standard test method. It involves drilling a hole into the concrete and using an electronic relative humidity probe to directly measure the moisture in the slab. 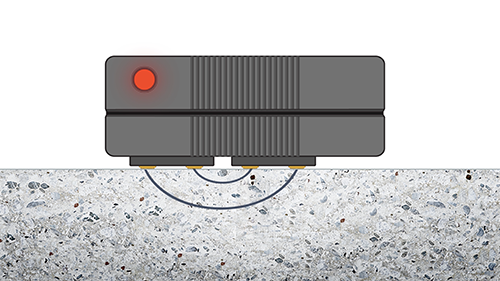 In-situ probes directly measure the actual moisture conditions within the concrete, regardless of mix, aggregate types, floor slab thickness, or surface conditions. ‍In-situ tests tend to provide a significant saving in testing time and labor versus calcium chloride tests. In-situ probes can be calibrated with traceability to national standards. 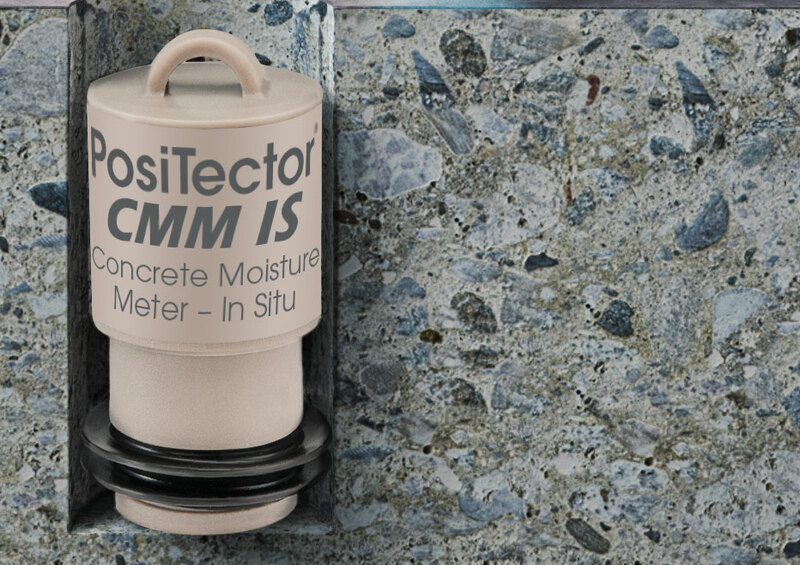 The PosiTector CMM IS In Situ Concrete Moisture Meter is the simple, durable and accurate way to measure concrete relative humidity in accordance with ASTM F2170. Each NIST-traceable probe includes a calibration check salt and chamber for conditioning and storage. 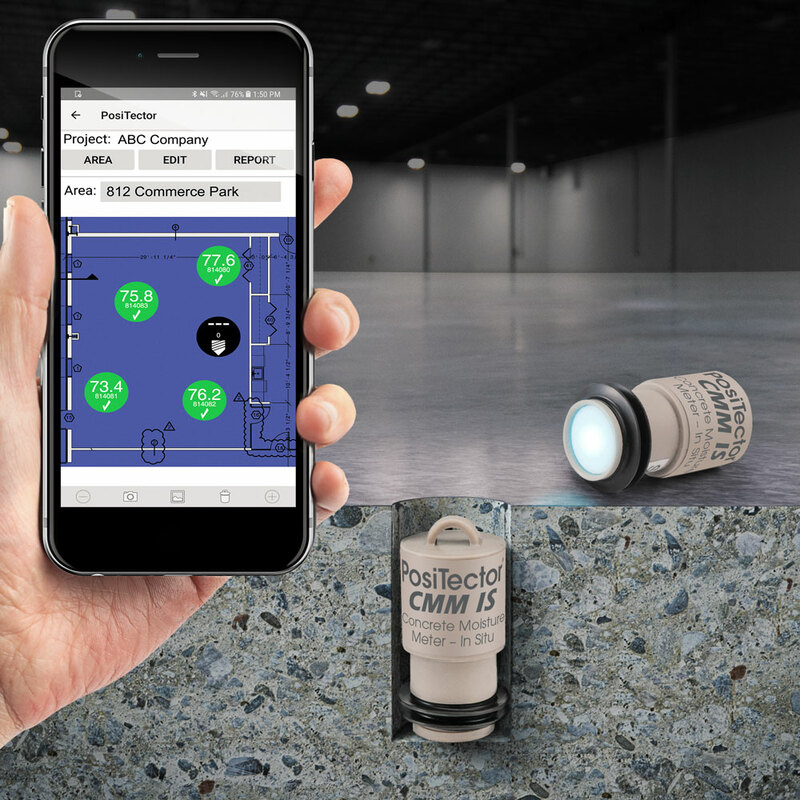 Probes feature auto-pairing Bluetooth Low Energy (BLE) wireless technology and transmit concrete moisture measurements to a smartphone operating the free PosiTector App (iOS and Android compatible) or to a PosiTector Advanced gage (serial numbers 784,000 and greater). Each PosiTector CMM IS probe operates for up to three weeks on a single coin cell alkaline battery and features an innovative combined sleeve and probe design providing the same function as a separate sleeve without the expense or hassle of consumables. Also included is a reusable, bright yellow cap to seal the probe within the test hole. 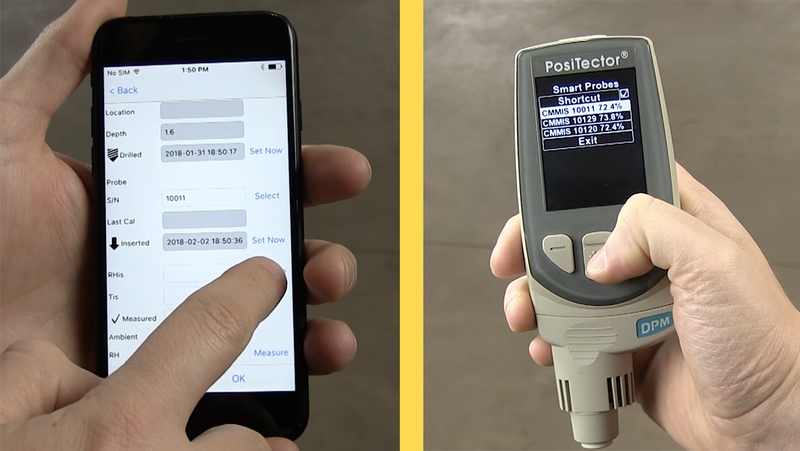 The free PosiTector App allows users to easily capture and report probe data in accordance with ASTM F2170. 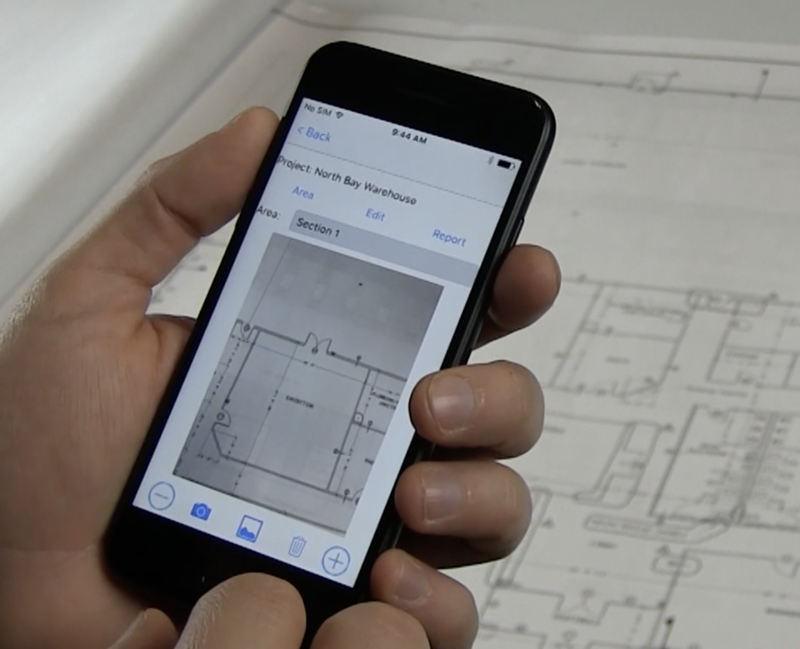 Using a compatible smartphone or tablet, overlay each probe on a floorplan and add metadata and notes as required by ASTM F2170. When testing is complete, quickly print a professional PDF report that includes all data required by the standard. Select from three PosiTector CMM IS kit configurations – Basic, Complete, and Pro. The Basic Kit is ideal for measuring concrete moisture in areas up to 1,000 square feet (100 square meters) and includes 3 probes, calibration certificates, check salts, calibration chambers, a measuring tape, and an extraction tool. The Complete Kit includes 2 additional probes, calibration certificates, check salts, and calibration chambers (5 total) and is ideal for measuring concrete RH in areas up to 3,000 square feet (300 square meters). Includes all items in the Basic Kit plus a hard shell carrying case and vacuum tool for cleaning the hole after drilling. The Pro Kit includes all items from the Complete Kit in addition to a PosiTector DPM3 Advanced gage for measuring ambient temperature and humidity above the drilled hole. It can wirelessly receive and record in-situ humidity and temperature measurements, displaying them alongside the ambient measurements. The PosiTector DPM3 also includes a surface temperature sensor ideal for concrete temperature measurement. The PosiTector CMM IS greatly simplifies the process of performing a concrete moisture test. Step 1: Determine the number of probes required. ASTM F2170 requires 3 probes for the first 1,000 square feet (100 square meters) and another probe for each additional 1,000 square feet (100 square meters). One test must be performed within 3 feet (1 meter) of each exterior wall. Use the PosiTector App to map and overlay probe locations by taking a photo of the test area floorplan with your smartphone. Ensure that the slab and the ambient conditions are at service conditions for a minimum of 48 hours before testing begins. Step 2: Verify probe calibration. 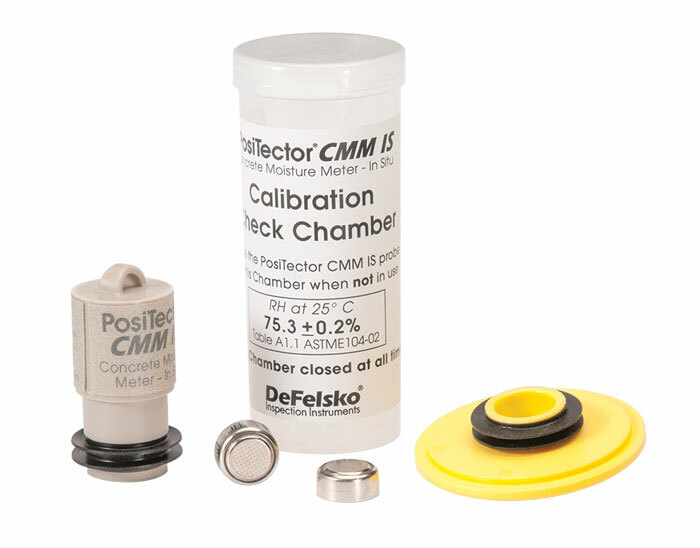 PosiTector CMM IS probes include a long-form certificate of calibration traceable to NIST. ASTM F2170 requires that each probe be calibrated within one year of use. ASTM F2170 also requires probe calibration to be verified within 30 days of use with a saturated salt solution. 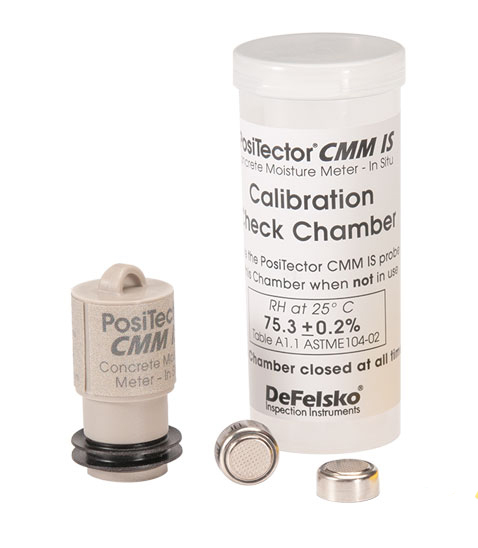 To make verification easy, each PosiTector CMM IS probe arrives conveniently pre-packaged in a calibration chamber complete with a saturated salt solution. Simply turn on the probe and insert it back into the chamber, ensuring that the probe reading matches the label on the chamber. Refer to the Verification of Accuracy section of the instruction manual for further details. Step 3: Drill the test holes. 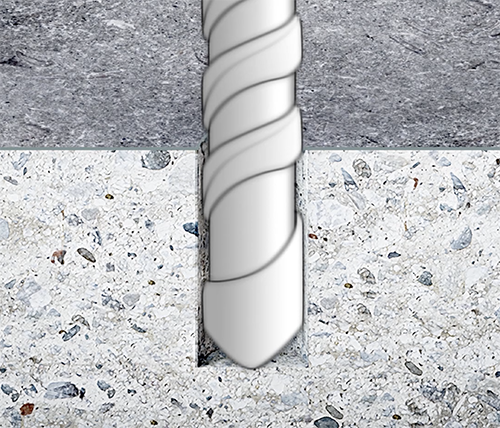 Using a hammer drill and ¾” drill bit, drill to the required depth – 40% of the slab thickness if it is drying from one side only (i.e. slab-on-grade) or 20% of the slab thickness if it is drying from two sides (i.e. suspended slab). Remove any debris from the hole and use the PosiTector App to note the time the hole was drilled. Step 4: Insert the probe. Place the PosiTector CMM IS probe in the hole (sensor end first) and gently push it to the bottom. Use the supplied yellow cap to seal the probe in the hole. Note the time the probe was inserted using the PosiTector App. Step 5: Collect in-situ readings. The probe begins measuring immediately and readings can be displayed at any time using the PosiTector App or PosiTector Advanced gage body. However, ASTM F2170 requires waiting 24 hours for conditions in the hole to equilibrate before measurements are recorded. After that time has elapsed, use the PosiTector App or PosiTector Advanced gage body to wirelessly record the in-situ temperature and humidity along with the time and date without opening the hole or removing the probe. Step 6: Withdraw the probe. Use the supplied extraction tool to remove the reusable PosiTector CMM IS probe from the hole when RH testing is complete. Fill the hole with a suitable patching compound. ASTM F2170 also requires that the ambient temperature and humidity above the hole be measured. If using the PosiTector App, lay a CMM IS probe on its side next to the hole and record the ambient conditions. If using a PosiTector DPM Advanced gage, ambient conditions are automatically recorded alongside in-situ measurements. Step 7: Report test results. With all probe data required by ASTM F2170 collected, the test is now complete. 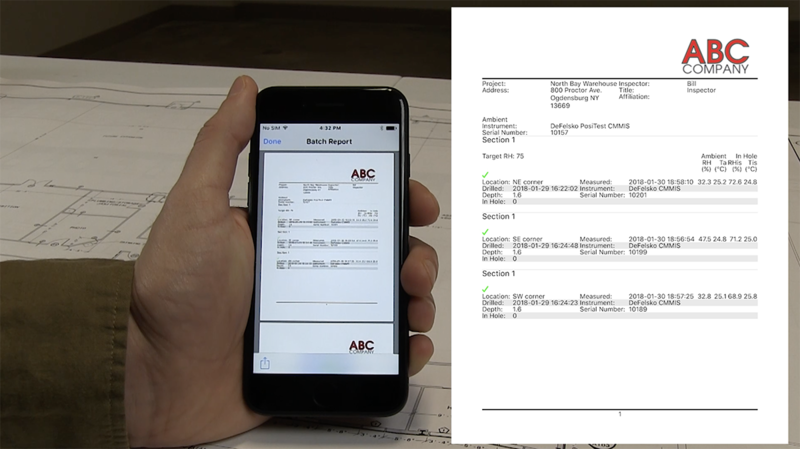 Use PosiSoft software to download stored readings from your PosiTector Advanced gage body, or press the “report” button in the PosiTector App to view a PDF inspection report. This report contains all information required by ASTM F2170 and can be e-mailed or saved. 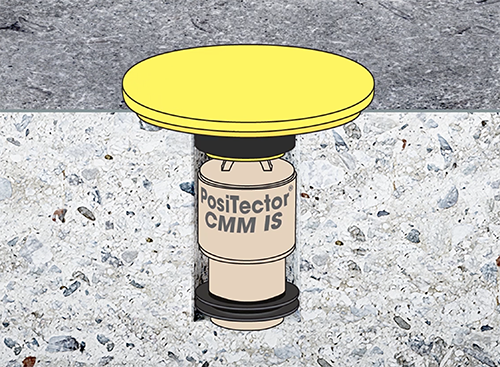 The innovative PosiTector CMM IS makes the process of concrete moisture measurement and reporting faster, simpler and more accurate. The certified, reusable probes are an ideal solution for measuring in situ concrete RH in accordance with ASTM F2170.